Uniforms are not only used for businesses, but also clubs, teams, associations and gifts for friends. Quick Signs can take your sketches and print on hats, shirts, jackets, pants and any other form of apparel. We also have the ability to take your logo and design something for your entire team/club and or business! 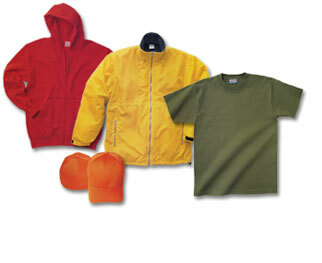 With our wide variety of t-shirts and colors, you can easily design the T-shirt you truly want to wear day in and out! Put your design on jackets, sweaters and coats. You can bring your own blouse or pick one from our selection. It’s not easy finding a hat you truly like. Wearing a hat shows your individual characteristic. Let us help you create your own individual hat, or one for your whole crew! Printing Cost is based on width and height of graphic. If your original design is rather complex, we recomend using the Full Color printing service. You also have the option of providing your own clothing items. $10 basic charge with one point print and cap print.